About 40 years later, a good friend – an exuberant soul, fond of all parties – was throwing a party for her son. Ryan was turning 18 and so scores of friends and family would celebrate the event. Ryan – an exuberant soul in his own right – has spent his life in beds and wheelchairs. I needed advice on a gift. What sort of object or gesture would be most welcome? The answer: Something he can look at. And so I began work on my first “half-size flyer”. I may have a photo somewhere. It was my pre-digital days, though, and I cannot find it. Nevertheless, I carved and built and painted what I had in mind. A Drake Mallard, about 9 inches LOA. His wings were plastic – probably cut out of a garbage can lid with the right, slight curvature – and his attitude was exactly what I wanted. The drake shows the very first signs of interest – the change in flight posture we always await. His feet are not yet down and the wings are barely cupped but his head is raised just enough. He is slowing down to take a look at the rig. 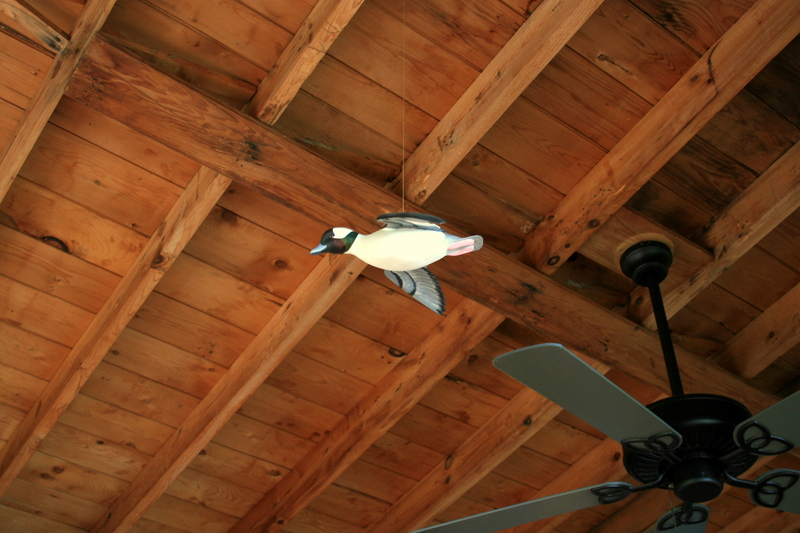 Ryan’s Mallard was “engineered” only to hang from above – from his celing so he could see it from his bed. Subsequent flyers come with two options: they can hang from above – thanks to a staple driven deep into their backs – or they can fly from a post, to live on a shelf or bookcase. 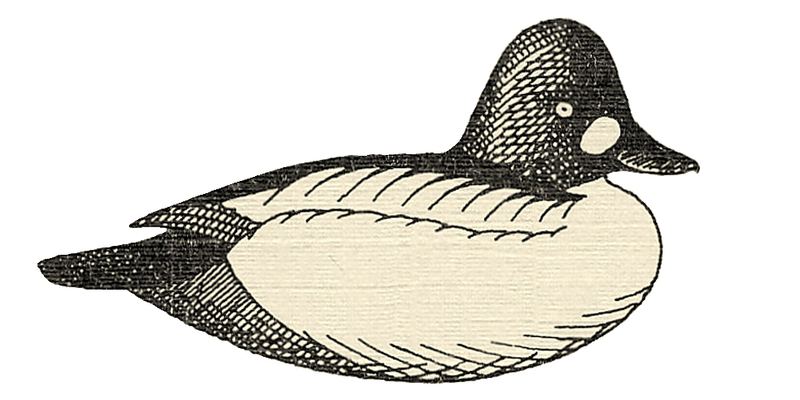 This Bufflehead – or Butterball as I learned the species in my Great South Bay youth – flies from the rafters in our camp on the shores of Lake Champlain. I plan to add others there over the years. All of my flyers now enjoy wings carved – and curved – from wood. 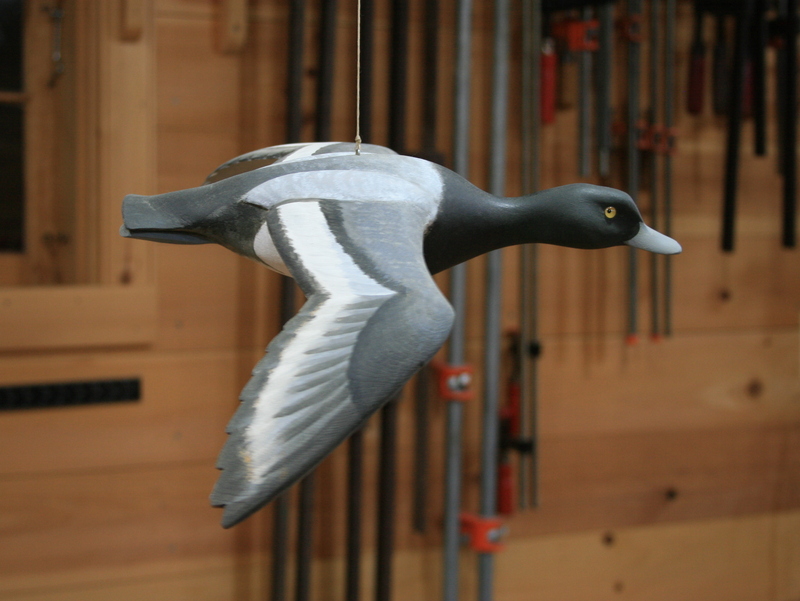 Late in the winter of 2011 I carved a flying Broadbill for my Dad. He would be turning 86 in April and so it would be his birthday gift. As with many who spent their lives gunning on Great South Bay, the Broadbill was always King to my Dad – as it is to me. I was very happy with my attempt but….the crown was not quite right. Although it is probably accurate – in that the wind really does compress the crown when a Broadbill is at speed, tearing over the rig – it does not convey what I see. In my mind’s eye, I always see a nice prime drake with that full, almost vertical crown – indomitable and impervious to the forces of the wind. It was not quite right and so not good enough for his gift. I do not recall what I gave that April. Actually, we celebrated in late March and there was more than one exceptional celebration – what turned out to be exceptional farewells. My brother called in late May to tell me that the final days were near. Susan and I headed down to Long Island the next day. I grabbed the Broadbill from where if flew in my shop and brought it to the hospital. My Dad never lost his excellent vision. I imagine it was a bit better than 20:20 in his last days. His cigarette-depleted lungs and the oxygen mask made speech a challenge, but he could see the Broadbill flying from the TV arm in his room. He gave me the classic OK sign – and I can still see the approval and appreciation in his eyes. He had only a couple of days left, but, that Broadbill will fly over my bench for the rest of my days. Drake Broadbill – with full crown. Bufflehead Flyer before it got to Lake Champlain. 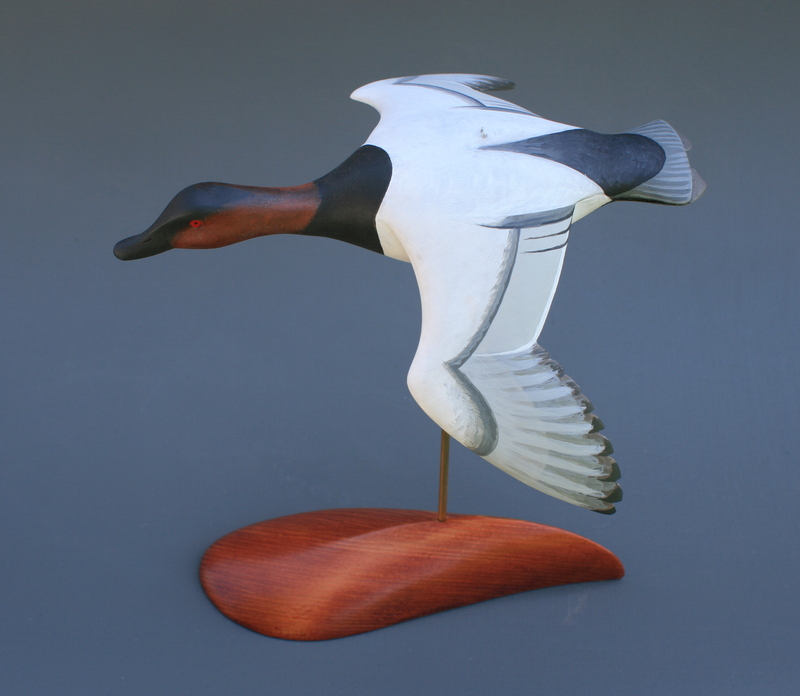 This Common Merganser was part of the Battenkill Inspired exhibit in Glens Falls. I have many more species ahead. I look forward to finding just the right attitude in each. Steven, these flyers are simply beautiful. I some how found out about the ‘Behr Paints’ around 7 years ago and began refurbishing my plastic decoys. Like yourself I’m really fond of the Herter’s decoys and would buy 6 every year from Cabela’s at the end of duck season, at their sale price. I feel that they are the best decoy out there!!!!!!! I was looking for flocking tips and just found the “Homer Dekes Website” and was really impressed. As we speak I just finished 6 Avery Specks that I bought 18 years ag. I flocked them, painted them, added a little airbrush flair and matte coated them to add to my Dave Smith Decoys. The sawdust trick looks fantastic and can’t wait to try it.